by Dr. Mario M. Bisi (written for astroengine.com when at UCSD, 2006-2009). The solar wind is an extension of the Sun's corona and is the final part of the Sun's “atmosphere”. It is best described as a supersonic outflow of coronal plasma (hot charged particles) out into interplanetary space and varies considerably in its density, velocity, and composition. The Sun's magnetic field is “frozen-in” to the plasma as it travels out into the solar system, thus causing the solar wind to also have a magnetic field, and in addition, carries the explosive events of the Sun out into interplanetary space. These resulting features travelling out in the solar wind are known as transient events (in the broard sense); the most popularly defined being coronal mass ejections (CMEs) which can have various consequences at the Earth and on other planets such as by creating magnetic storms (at Earth, these are known as geomagnetic storms) and thus often resulting in magnificent displays of aurorae. A photograph of the Aurora Borealis (Northern Lights) from the mainland-Norway Tromsø EISCAT site in late October 2003 during the famous “Halloween Storms”, by Dr. Mario M. Bisi. The solar wind carries away about 10-13 of the Sun's mass every year. However, this is nothing to be concerned about since if the Sun were to live long enough for all of it's mass to be turned into solar wind outflow, it would need to survive for another 10,000,000,000,000 (1013) years. The Sun, our star, has an expected life of just 10,000,000,000 (1010) years and presently we're at around the ½-way point in our star's life. 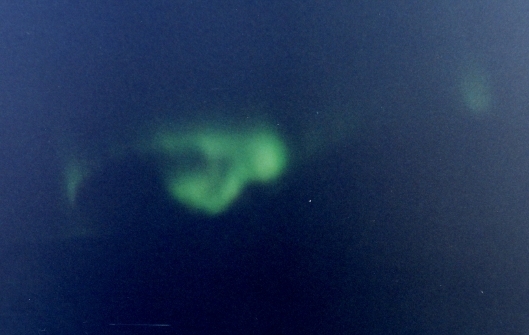 The existence of the solar wind was first thought about back in the early nineteenth century in an effort to explain the phenomenon of the aurora that appeared at mainly high latitudes in the Earth's atmosphere and the photo shown above is an example of the Aurora Borealis taken from the European Incoherent SCATter radar (EISCAT) Tromsø site on mainland Norway in October 2003. However, there are several possibilities of aurora being documented as far back as 2000 B.C. by the Chinese, around 600 B.C. by the Xenophanes (who mentioned moving accumulations of burning clouds), and also in some Greek literature. Thus, at least the colourful effects of the solar wind on the Earth have been known about for quite some time. Eventually, it was from comet-tail observations that led to the realisation of such a flow of particles from the Sun out into the solar system through the interplanetary medium. This flow was later termed "The Solar Wind". A picture showing the four EISCAT sites - starting from the left: Tromsø (by Dr. Mario M. Bisi, October 2003), Kiruna (by Dr. Mario M. Bisi, May 2003), Sodankylä (taken from here, May 2003), and the EISCAT Svalbard Radar (ESR) 42-metre dish in the foreground and steerable 32-metre dish in the background along with the site building (by Dr. Mario M. Bisi, May 2005). C.A.T. scans of the solar wind are routinely undertaken at CASS-UCSD using interplanetary scintillation (IPS) observations from Earth-based radio arrays/telescopes or white-light (visible-light) observations from the low Earth orbit (LEO) Solar Mass Ejection Imager (SMEI). The inner heliosphere can be reconstructed in three dimensions through the use of the CASS-UCSD 3D C.A.T. reconstruction programs incorporating a time-dependent (or co-rotating) kinematic solar wind model which conserves mass and mass flux of the solar wind. This program uses the IPS density and velocity determinations (or SMEI density determinations) to reconstruct the 3D density and velocity distributions in the inner heliosphere out to 3 Astronomical Units (AU). An AU is the mean (average) distance from the Sun to the Earth which is approximately 150,000,000,000 (1.5×1011) metres (m). The examples below are all computed using the 3D time-dependent model which uses perspective views of outward-flowing material crossing the observing lines of sight from Earth to radio source (for IPS) or from Earth to sunlight scattered off of electrons in the heliosphere (for SMEI). IPS observations of astronomical radio sources to enable measurements of solar wind density and velocity have been carried out for over 45 years. IPS is the amplitude fluctuation of radio waves from distant compact radio sources caused by density inhomogeneities (variations) moving outward in the solar wind. Such observations can be carried out using the EISCAT/ESR systems, but 3D C.A.T. 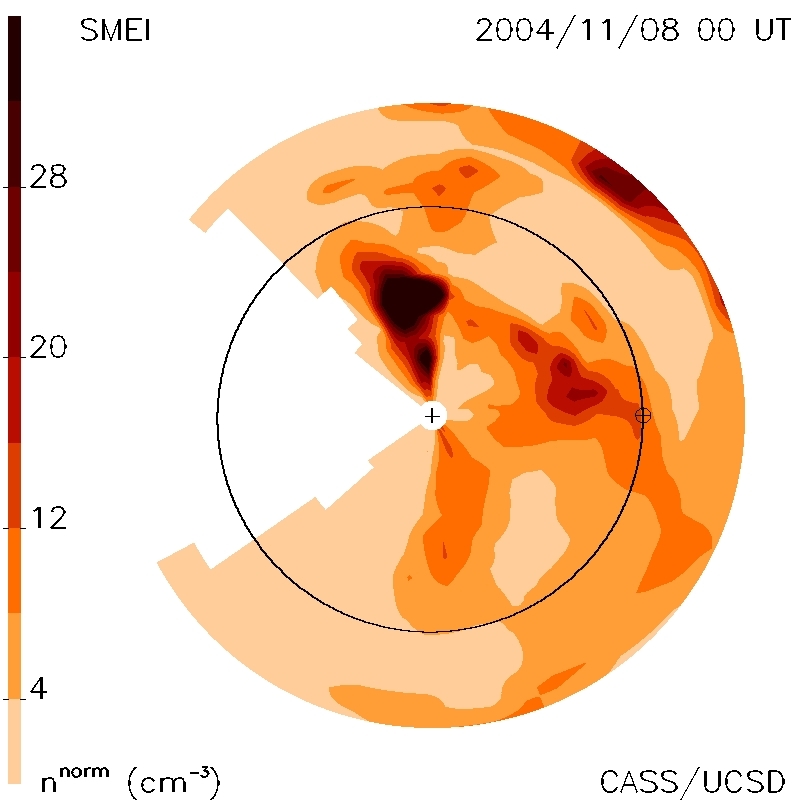 of the inner heliosphere has most-often been carried out using IPS observations made using the radio arrays operated by STELab. In addition, successful tests have been carried out using the Ootacamund (Ooty) Radio Telescope (ORT) located in the Nilgiri Hills of southern India for both density and velocity 3D reconstructions of the inner heliosphere. The STELab antennas from left-to-right: Fuji, Sugadaira, Toyokawa (old antenna), and Kiso (courtesy of STELab). These C.A.T. 3D reconstructions allow solar/heliospheric scientists to view (in the form of various images, some examples are given here in this article) the 3D inner heliosphere and to determine the extent of structures moving out in the heliosphere. In addition, much physics can be gained from the reconstructions such as the determination of masses of CMEs, solar wind “ram” pressure, velocity, density, and magnetic field at the four inner planets (Mercury, Venus, Earth, and Mars), and also the reconstructions can be very useful for Space Weather Forecasting. This image shows a cut in the ecliptic plane through a 3D reconstruction on 08 November 2004 at Midnight (0000) UT (GMT) which was reconstructed using white-light data from SMEI. The view is from directly North of the ecliptic; the Sun is at the centre marked by a +, the Earth is on the right marked with a ⊕ along with its orbit as a black near-circular line around the Sun (the Earth orbits anti-clockwise around the Sun from this point of view). The darker the colour, the greater the density of material in the ecliptic. The scale on the left is the number of electrons (H+) per cubic centimetre (cm-3). 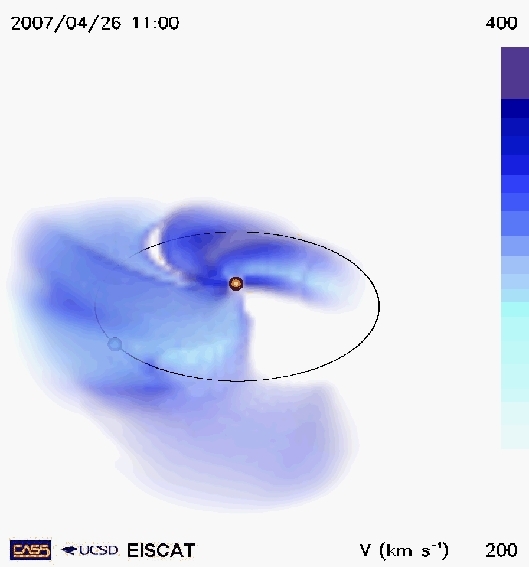 Near the Earth at this time, this reconstruction shows two interplanetary CMEs (ICMEs) which formed from a combination of 4-5 CMEs and resulted in two strong geomagnetic storms at Earth during 04-12 November 2004. This image shows the heliospheric volume of the 3D reconstruction of solar wind density on 14 May 2005 at 1500 UT as derived from the STELab IPS observations. All features not related to a CME which launched from the Sun on 13 May 2005 have been removed for clarity of viewing. The X and Y axes define the Earth's orbital plane and the Z axis is perpendicular to this into the northern heliospheric hemisphere. The lighter the colour, the greater the density in the reconstruction in this case (opposite to the SMEI data reconstructed image). Density is shown from 8 electrons cm-3 and upward. The Sun is represented by the central yellow sphere and the Earth by the blue sphere (along with its orbital path also in blue), and the view is from East of the Sun-Earth line. The dense material heading out from the Sun to the Earth is that of an ICME resulting from the 13 May 2005 CME. 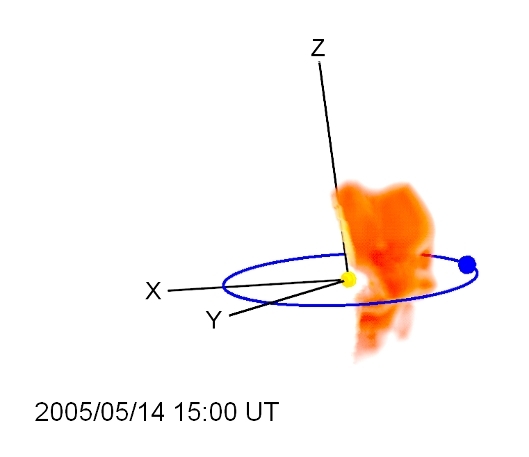 The ICME later hit the Earth on 15 May 2005 and again resulted in a geomagnetic storm. This image shows the 3D reconstructed velocity in the inner heliosphere from EISCAT IPS observations as if from a remote observer 45° West of the Sun-Earth line and 30° above the ecliptic plane. The velocity range has been limited to show only velocity structure in the range of 200 kilometres per second (km s-1) to 400 km s-1 (a km is equivalent to 1,000 m). The spiral-type features seen in this case are known as co-rotating regions and are a result of the Sun's rotation plus the various speeds of solar wind which can interact as they travel out from the Sun through the heliosphere. These co-rotating regions often result in regions of strong interaction between slower and faster solar wind speeds, and as such, can also sometimes cause geomagnetic storms if the interaction is suitably intense. This article just briefly touches on what 3D C.A.T. scans of the inner heliosphere are, and how they can be used; but there are many detailed abstracts from conference presentations (along with links to some of these presentations) and scientific papers (along with links to some scientific papers) which describe and use this technique for solar, space, and heliospheric scientific research. Much of this work is sponsored in the U.S.A. by the National Aeronautics and Space Administration (NASA), the National Science Foundation (NSF), and the U.S. Air Force (AFOSR-AFRL). All work in this article is copyright © to Dr. Mario M. Bisi unless otherwise cited or noted!